I have a confession to make. I use saw filing guides. I know, I know, no professional saw filer worth his salt needs any kind of guide to help them sharpen. Well guess what? I’ve been sharpening hand saws for almost 15 years now, and I’ve had my hand saw sharpening business for over 10. In the last 15 years, I’ve sharpened hundreds and hundreds of saws, built dozens of saws from scratch, conducted numerous hand saw sharpening classes and seminars, and shown people as young as 8 years old how to sharpen hand saws. In all this time, I have almost always used some kind of guide to maintain consistent rake and fleam angles. Shop made wooden blocks can be made to assist in holding the saw file at the correct rake and fleam angles while sharpening. Commercial versions can be adjusted to any angle and will hold almost any size file. It’s not that I’m incompetent (at least not when it comes to sharpening hand saws). I can, and do, in fact sharpen hand saws without a guide. Doing so isn’t really that big of a deal. You put the file in the gullet, the file settles into the proper angle, you pinch the front of the file between your fingers to lock that angle, and you push the file forward. It’s a pretty simple task. There’s a catch though – probably fewer than 5% of the saws that come through my shop just need sharpening. When I teach saw sharpening classes, I always make a very important distinction between sharpening a hand saw, and restoring a hand saw. You see, maintenance sharpening of a hand saw that has properly shaped, evenly spaced teeth is a piece of cake. I can give a Lie Nielsen or Bad Axe or Veritas saw to my 12 year old and she can sharpen it almost as well as I can. That’s because these saws are already in good condition. When a saw already has the proper rake and/or fleam angles established, maintaining those angles is no harder than what I wrote above. The problem is, most people are not learning to sharpen saws using their precious Lie Nielsen, Bad Axe or Veritas saw, which, in my opinion, is a shame. You will likely never find an easier way to learn to sharpen than on one of these saws. However, no one ever takes this advice, fearing they will ruin their saw beyond repair (which you can’t do by the way). Instead, everyone chooses to learn hand saw sharpening on saws that are in the absolute worst condition they could possibly be in. Hand saw restoration, however, has a much steeper learning curve. When you look at a saw and the toothline is concave, and the teeth are different sizes, and not evenly spaced, and not all at the same rake and fleam angles, and maybe some teeth are missing, you’ve got a lot of work to do before that saw can be sharpened. So even if the saw file does settle nicely into the gullet between two of the teeth, chances are, it won’t on the next gullet, at least not at the same angles. So you’re faced with a major reshaping job to reestablish proper and consistent geometry on all of the teeth. While a really experienced filer can do this by eye, it is easiest accomplished with the help of some jiggery. 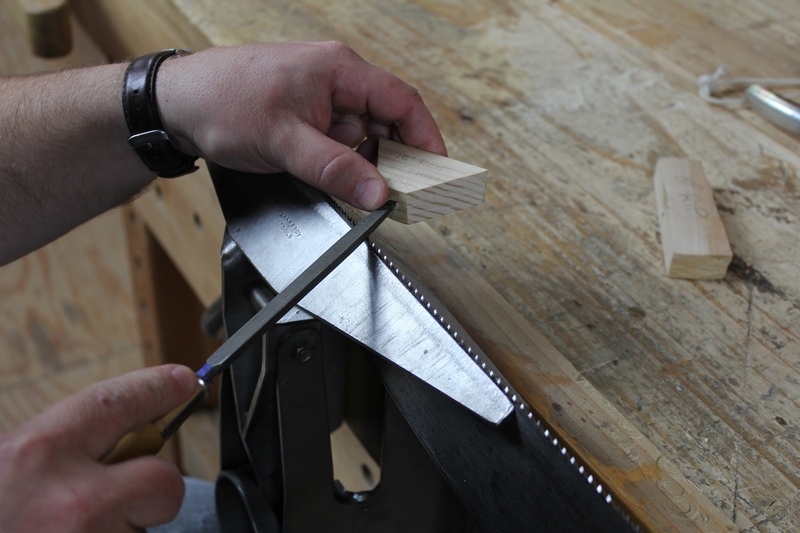 When filing a corsscut saw using a wooden guide block, the angle cut on the end of the block is aligned so that it is perpendicular to the blade of the saw. This maintains the proper fleam angle. For years and years, I made my own rake and fleam angle guides from scraps of wood. Doing so is simple and economical. You bore a hole in a block of wood, draw a line at the desired rake angle tangent to the hole, and jam the file in the hole, aligning the face of the file up with the rake angle line. If you’re filing a crosscut saw, then saw off the ends of the block at the desired fleam angle. In use, you keep the wood block level to maintain the proper rake angle, and you keep the sawn edge perpendicular to the blade to maintain the proper fleam angle. 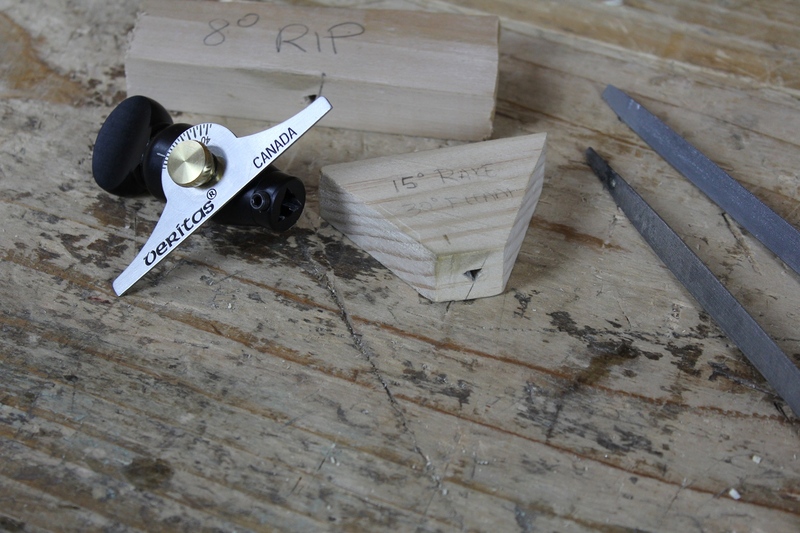 If you’re only going to sharpen a handful of saws, and use only a couple of angles, I think these guide blocks are all you’ll ever need. Chances are you can make them once and never have to make them again. After years of sharpening saws professionally, I had an entire drawer full of these blocks for all different angle combinations and file sizes. I had also worn out and remade dozens of them. So these days, I’ve switched to using a commercial file holder. There are a couple of these available on the market. I’m using the simple Veritas Saw File Holder, but there is at least one other similar option available. I think these commercial file holders are a nice option for folks like me that sharpen a lot of saws and use a variety of different combinations of rake and fleam angles. Since it is adjustable for both of these angles, I only need one guide instead of a drawer full of them for different configurations. The Veritas file holder also holds any size file, and does so more securely than a wooden block. 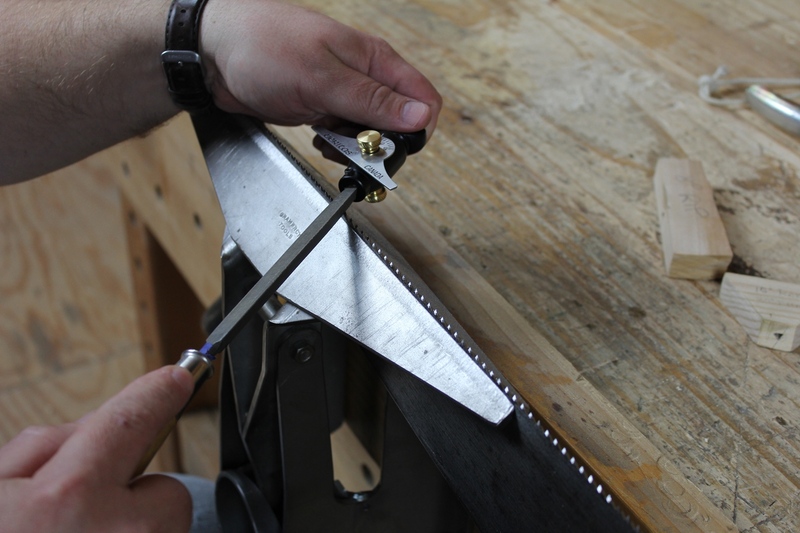 When filing a corsscut saw using the Veritas Saw File Holder, the fleam angle guide is aligned so that it is parallel to the blade of the saw. The primary difference between the Veritas file holder and a wooden guide block is that while the fleam guide on the wooden block is intended to be held perpendicular to the saw blade, the fleam guide on the Veritas is meant to be held parallel to the saw blade. In use, it really doesn’t matter. Even with a guide, the fleam angle is very reliant on your eye. So any kind of fleam guide is going to be an approximation at best. I don’t think that’s a bad thing though. I’ve found that holding an exact fleam angle isn’t all that important. So if you are a new saw filer, or have filed a few saws but are struggling a bit holding consistent angles, I definitely recommend using some kind of guide to help you. Whether you use a wooden block or a commercial version is a personal decision, but some kind of guide is definitely a big help. Posted in Hand Saws, Sharpening, Skills, Tools and tagged hand saw sharpening, Veritas Saw File Holder.